Who Deserves the Most Blame? The video clip is stomach-turning. A Domino's employee in Conover, N.C., is seen assembling sandwiches, spraying snot on them, sticking cheese up his nose before placing it on a piece of bread and passing gas on a slice of salami. The woman holding the camera narrates. "In about five minutes, they'll be sent out to delivery, where somebody will be eating these, yes, eating them. And little did they know that cheese was in his nose and that there was some lethal gas that ended up on their salami," she proclaims proudly. "That's how we roll at Domino's." The woman, Kristy Hammonds, 31, uploaded the video on YouTube. In a matter of days, thanks to Twitter and other viral social media, the clip had been viewed more than a million times and Domino's had an instant crisis on its hands. (The original video has been removed, but copies are still easily available online.) Both Hammonds and the other employee in the clip, Michael Setzer, 32, have been fired from the pizza-delivery chain and now face felony charges for distributing prohibited foods. Hammonds and Setzer say the video was just a prank, and that the unsanitary food was never delivered. The company did not publicly respond to the video immediately, hoping attention would subside. But when it became clear by mid-week that the controversy was only escalating, Domino's executives acted. The company posted an apology on its website and asked employees with Twitter accounts to tweet a link to it. The company also created its own Twitter account, @dpzinfo, to reassure consumers that this was an isolated incident. And Domino's U.S.A. president, Patrick Doyle, issued an apology on YouTube. These moves do carry certain risks  the more you seek forgiveness, the more people discover you have sinned  but for the most part, brand experts give Domino's high marks for its response. "First of all, they handled it very well with the video response," says Pete Blackshaw, brand strategist for Nielsen Online. "It could have been a little bit quicker, but the company needed time to get its facts straight. It was near perfect." That being said, Domino's is far from healed. "This is going to be a tough one," says Dodie Subler, founding partner of Tait Subler, a consulting firm. "Domino's is known for its excellent training program, but these guys broke the code of ethics. It will be hard for Domino's to recover." The worst part of a viral video crisis is that the clips live forever online. Says Blackshaw: "The Web never forgets." 1. Blog. Blackshaw advises Domino's to create a blog on its website, where the company can highlight great deals, new marketing campaigns, and, yes, the fact that 99.9% of its employees do not spit on the food. "I don't want to overhype blogs, but they can serve as very powerful rapid response vehicles," says Blackshaw. Domino's spokesman Tim McIntyre says the company had been discussing starting such a blog, even before this crisis hit, and is still debating how to approach it. "Who blogs?" asks McIntyre. "Is it our CEO, or our chief marketing officer? Do we take a team approach, or do we have one person who is the voice of Domino's?" However the company decides to proceed, now is the time to do it. 2. Go Back to Its Base. Whether they're pepperoni junkies or hungry college kids, Domino's customers are extremely loyal. And now more than ever, the company needs to tap into this crust-chomping base. Domino's can gather the names of all customers who have offered positive feedback over the last couple of years, and send those people a quick letter or e-mail saying: This incident is isolated, we appreciate your business and, please, encourage your friends to stick with us too. "Managing brand influencers is so critically important," says Blackshaw. "Domino's doesn't have the same evangelist level as a company like Apple, but their core consumers can move the needle." According to McIntyre, Domino's is in the process of employing this strategy. 3. Update Wikipedia. Blackshaw calls Wikipedia a "reputational broker," a gateway through which financial analysts, the media and even current and future customers come in contact with the brand. 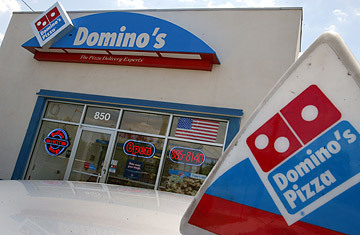 By late afternoon April 17, the Wikipedia entry for Domino's noted the following about the controversy: "In April 2009, videos depicting two Domino's employees, Kristy Hammonds and Michael Setzer, in Conover, North Carolina, tampering with customer food were uploaded to the YouTube video hosting service. Later, the duo was arrested and charged." What's missing? "The Domino's video response," says Blackburn. "That's a crucial component of brand editing." Wikipedia's editors typically strike links to anything that smacks of propaganda, but says Blackshaw, "I'd be surprised if Wikipedia pushes back. A response from a Domino's executive to a major controversy is fair game." McIntyre says a Wiki-reply is "on the list." 4. Friend Google. If you searched for "Domino's" on Google on April 17, the video, entitled "Disgusting Domino's People," was the third result (the president's video apology, entitled "Disgusting Dominos People  Domino's Respond," was the fourth). If you searched for "Domino's and disgusting," the whole first page of results dealt with the incident. One link screams "Never Eat at Dominos Again." The company has to move more aggressively to cancel out the negative reinforcement in the Google results. Domino's could, for example, purchase ads from Google that would appear at the top right corner of the page of "Domino's" search results. The ad could say "Domino's Apologizes" and link to the video from the company executive. Another ad could highlight a new promotion or discount. Right now, that space is blank on the page. Why not fill it up with positive messages from the company? Domino's says it is considering this option. 5. Take a Commercial Break. Domino's is between ad campaigns. The recent commercials featuring CEO David Brandon in Washington promising customers a "bailout" via $5 Domino's pizza have stopped airing, and the company plans to unveil new commercials within the next week. Put them on hold, says Subler, the brand expert. "There's no need for mixed messages right now," she says. Her logic: Let things cool down for a few weeks. Introducing TV commercials for a new product may only serve to recall the incident. And people may wonder why the company isn't addressing the negative news head-on: Why is Domino's pushing a new product on us when we still feel traumatized by those two moronic employees? Domino's won't be taking this advice. The ads are still on, no question, says McIntyre. "I can understand that train of thought," he says. "'Hey, make the whole thing go away. Wipe the brand from consciousness for a while.' But the other thought is that the more you maintain a sense of normalcy, the faster you'll get back to normal." So the company is trying its best to move forward. Domino's can only hope that its customers let go of controversy as quickly as it likes its deliveries.